Labyrinthos is joining forces with California-based labyrinth designer and photographer Lars Howlett, for a unique and unforgettable journey to Sweden next spring. Come with us to see ancient Viking graves and runestones, medieval labyrinth frescoes, as well as picturesque windmills, lovely fishing villages and local museums. Midsummer days in the Baltic are long, the weather mild, and this journey promises to be incredible. The tour is limited in size in order to deepen our experience as we travel the backroads to see little-known sites and experience the labyrinths with a group of like-minded companions. We will base ourselves in Visby, a UNESCO World Heritage site on the island of Gotland. With its island culture, medieval walls, and beautiful historic labyrinth, Visby delights visitors from around the world with its architecture, cuisine, and breathtaking sunsets – as it has done for centuries!. We’ll be taking day excursions to explore, walk, and study the stunning variety of labyrinths dotted around the island, returning to Visby in the evening to enjoy leisurely dinners in the walled city and spend time on the historic stone labyrinth that is just outside the city walls. 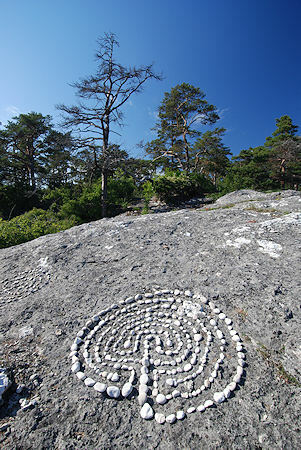 Our pilgrimage will include labyrinth walks, tours, presentations, and workshops, along with time for for reflection and consideration of the labyrinth’s history, design, and potential in our lives and work. This is a unique opportunity to study and experience the labyrinth within a culture that has embraced variations of the design for many centuries. Kimberly & Jeff Saward are experienced guides and expert labyrinth historians. Kimberly is a past president of the Labyrinth Society and specializes in the spiritual and mythological understanding of this ancient archetype. Jeff is one of the preeminent scholars of labyrinths in the world, authoring several books about their historical and cultural evolution. Lars Howlett is a photographer, teacher, and labyrinth builder who practices walking meditation and mindfulness through the creation of site specific installations through improvisation and intuition. Together, they offer a journey that will appeal to artists, historians and spiritual seekers alike.